FILE - Tibetan spiritual leader the Dalai Lama prays at Tsuglakhang temple in Dharmsala, India, May 27, 2017. The Dalai Lama, the exiled Tibetan spiritual leader, has again called on his fellow Nobel Peace Prize recipient Aung San Suu Kyi to peacefully end the Rohingya crisis. "May I take the liberty of writing to you once again to tell you how dismayed I am by the distressing circumstances in which the situation seems to have deteriorated further," he wrote to Myanmar's de facto leader. VOA's Tibetan Service received a copy of the letter, in which he refers to discussions the two had a few years ago, when he urged her to use her "influence to bring about a peaceful" resolution to the problems of the Muslim community. In June 2016, he urged her to "make efforts to reduce" the tension. FILE - Aung San Suu Kyi talks during a news conference in Naypyitaw, Myanmar, Sept. 6, 2017. "It is disappointing to observe that the problem appears to be getting worse and the violence is increasing," he wrote. The letter apparently was sent two weeks ago. The Dalai Lama also warned Aung San Suu Kyi and other Myanmar leaders that not resolving the crisis peacefully could lead to "further unrest and destruction." "I appeal to you and your fellow leaders to reach out to all sections of society to try to restore friendly relations throughout the population in a spirit of peace and reconciliation," he said. The Tibetan Buddhist leader said this is not only a correct and "realistic way" for the nation to move forward, but also a way to "earn the world's goodwill and respect." "As a fellow Buddhist and Nobel Laureate, I am appealing to you and your colleagues once more to find a lasting and humane solution to this festering problem," he said. The Buddhist community protests violence against Rohingya Muslims in Myanmar’s Rakhine state, in Dhaka, Bangladesh, Sept. 11, 2017. On Friday, the Dalai Lama told reporters he had no doubt that Buddha would have helped the Rohingya people. The Rohingya are a Muslim minority group in Myanmar, which is largely Buddhist. Most live in northern Rakhine state. The Myanmar government considers them illegal immigrants, although most families have been in the country for generations. Late last month, a group called the Arakan Rohingya Salvation Army attacked police posts in Rakhine, sparking a violent crackdown against Rohingya villages. More than 300,000 people have fled to Bangladesh, reporting deliberate attacks against civilians, including children. Zeid Ra'ad al-Hussein, the United Nations high commissioner for human rights, on Monday condemned the security operation in Rakhine state, saying it "seems a textbook example of ethnic cleansing." Other Nobel laureates have called on Aung San Suu Kyi to take action, including South Africa's Bishop Desmond Tutu, Iranian rights activist Shirin Ebadi and the youngest recipient, Malala Yousafzai. 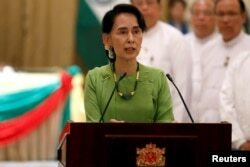 Some regional experts have noted that Aung San Suu Kyi leads a fragile new democracy and faces pressure from the country's military, which dominates Myanmar.